THE first woman diocesan bishop in the Church of England has been consecrated, with the Right Rev Rachel Treweek becoming the Bishop of Gloucester. 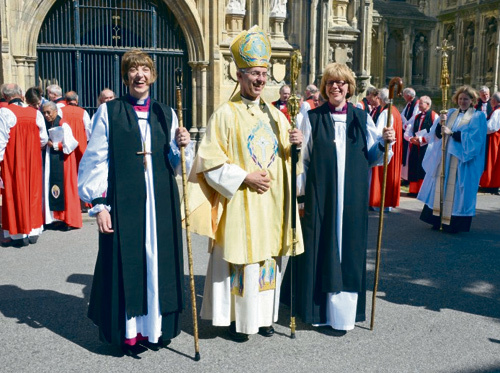 Many well-wishers from the diocese, which includes Chipping Sodbury, made the journey to Canterbury Cathedral for the historic service, which was led by the Archbishop of Canterbury, Justin Welby. During the service she was presented with her episcopal ring – designed and made for Bishop Rachel by jeweller Paul Spurgeon - and pectoral cross. The cross was created from bullet shells found on the battlefields of Mozambique’s civil war and represents her involvement with a link with the country for a number of years while an archdeacon in London. Bishop Rachel said: “I am excited and full of anticipation and joy for what lies ahead as I begin my ministry as Bishop of Gloucester. Before ordination, Bishop Rachel trained as a speech and language therapist, a role she practised for more than six years.